Lavender: Lavender Agarbatti has a natural fragrance of Lavender flower. It has a sweet, balsamic, floral aroma. Sandal:Sandal Agarbatti is in natural fragrance of Sandalwood oil. It has a sweet-woody, warm, balsamic aroma that improves with age. It has several aromatherapy benefits like relaxing, centering, sensual. Lily:Lily Agarbatti contains natural extract of Lily flowers. Lily Agarbatti has aromatherapy benefits like it has strength to treat individuals suffering from depression as it tends to help in creating a feeling of modesty, happiness and a sense of security. Parijat: Parijat Agarbatti has a refreshing aroma that reduces anxiety and depression. . The exotic fragrance provides the key to unlock the benefits of aromatherapy to enhance mood or environmental effect. Champa:Devbhakti Champa Agarbatti having natural extract of champa flowers helps in giving good calming and soothing effects on the mind and soul which helps in keeping the mind stable and the stress and anxiety can be reduced up to a much greater level by using this Champa incence sticks. Mogra:Devbhakti Mogra Agarbatti provides several benefits including uplifting the mood. The scent of mogra is said to be useful in treating depression in particular posts partum depression & emotional depression. 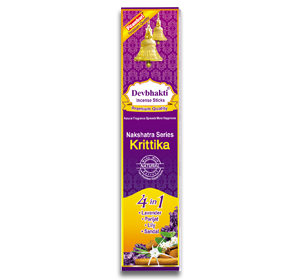 Kewda:Devbhakti Kewda Agarbatti has a natural fragrance of Kewda flower that provides supportive & grounding effect. It is used in various ceremonies & ritual purification. 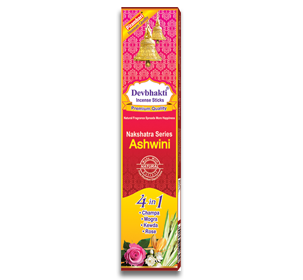 Rose:Devbhakti Rose Agarbatti has a pleasing fragrance & non-toxic nature. It has a sweet fragrance & another one of wonderful benefits is that it can help relieve anxiety & stress, sharpen memory & boost mood. 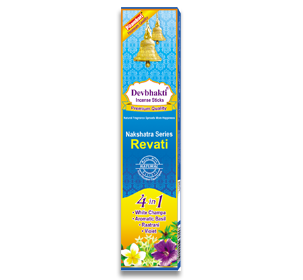 This Nakshatra Series of Revati 4in1 pack has pleasant fragrances like Lavender, Parijat, Lily and sandal. White Champa:Devbhakti White Champa has a bright, fresh, fruity, floral aroma. It symbolizes the magic of the secret garden & having 5 petals resembling a star. It is one of the most enticing & captivating scents due to its uplifting & soul soothing qualities & ancient India believed it to be the “ the tree of Life” due to its healing capacity. The fragrance will instantly relieve stress & replenish the mind & body. Aromatic Basil:An elite class of adaptogenic herbs prized for their ability to fundamentally restore balance & harmony in the mind, body & miraculous healing properties. Raatrani:This natural fragrance of Raatrani smoke of the dried flower increases the spiritual healing. It has a calming, relaxing effect. Violet:Devbhakti Violet Agarbatti has a natural fragrance that helps to induce the sleep & to calm the anger. 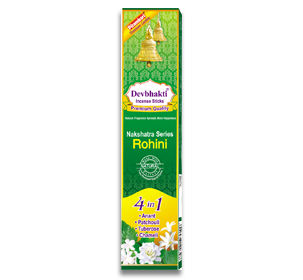 This Nakshatra Series of Rohini 4in1 pack has pleasant fragrances like Lavender, Parijat, Lily and sandal. Patchouli:Patchouli agarbatti fragrance works great for people suffering from depression. Patchouli aroma has impact on the hormones & various chemical reactions in the body and mind. Feelings of anxiety, anger & sadness simply disappear. Anant:Anant flower aroma has historically been used to relax, reduce anxiety & calm. It provides calming & soothing properties & still used to alleviate depression, anxiety & irritability. Tuberose:Devbhakti tuberose agarbatti strengthen the mental state of mind & it’s been used for meditation. This oil can be attributed to its properties as an aphrodisiac, deodorant, relaxing sedative & warming substance. The components of this oil have relaxing effects on brain & nerves. Chameli:Devbhakti Chameli Agarbatti acts strongly on mental & emotional levels, having powerful uplifting effects on the mood. It promotes beta rhythm in the brain, those associated with mental alertness. Its aroma has one of the most effective anti-depressant properties. 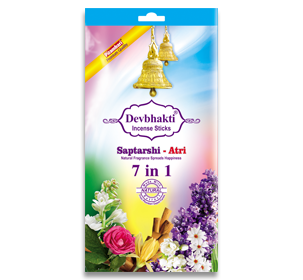 This Saptarshi Series Atri 7in1 pack has pleasant fragrances like Parijat, Lily, Sandal, Champa, Mogra, Rose, and Lavender. Lavender: Lavender Agarbatti that is available in natural fragrance of Lavender flower. It has a sweet, balsamic, floral aroma. It offers relief from physical and emotional problems. Sandal: Imparts relaxing, cooling, sensual effect to improve the state of mind. Champa: Fragrance is long lasting & Experience Peace of mind & Spirituality. Mogra: Gives calming, revitalizing & soothing effect which helps restoring optimism and energy. Rose: Rose has a pleasant natural fragrance that helps you while meditating, keeping you relaxed and helps achieve rest & calmer state of mind. Parijat: Refreshing aroma reduces the anxiety and depression of an individual. Lily:Create a feeling of modesty, happiness and a sense of security. 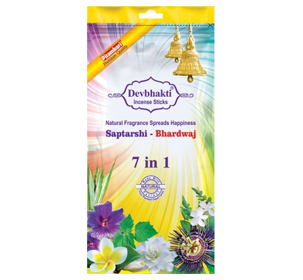 This Saptarshi Series Bharadwaj 7in1 pack has pleasant fragrances like Kewda, Violet, White Champa, Panadi (Patchouli), Ananta, Krishnakamal, Chameli. Kevda: Promotes tranquility and relaxes your mind. Violet: Promotes relaxing, soothing and inspiring properties. White champa: It is highly considered for centuries for its healing powers & use as scent's for rejuvenating qualities for the mind and body. Panadi: The exotic fragrance helps in reducing anxiety, stress and depression. It has balancing effect on the emotions and is often used in relaxation and for meditation. Anant: Lower the anxiety & maintain the peace. Krishnkamal: It Calms the mind & relaxes the brain. Chameli:Stimulate mind to boost the energy and uplift your mood.